Have you been contemplating registering for the Dolphins Cancer Challenge (DCC) but you aren’t sure where to start? You’re in luck! DCC, which benefits Sylvester Comprehensive Cancer Center at UM, has a 5k option that welcomes walkers, joggers, and sprinters alike. Still not sure you’re ready to commit to 3.1 miles of (cancer fighting) fun? We’ve mapped out pedestrian routes on every campus to inspire your training. So, lace up your kicks and take in the fresh Miami air on your lunch break—right after you use code teamhurricanes100 to get your free registration. 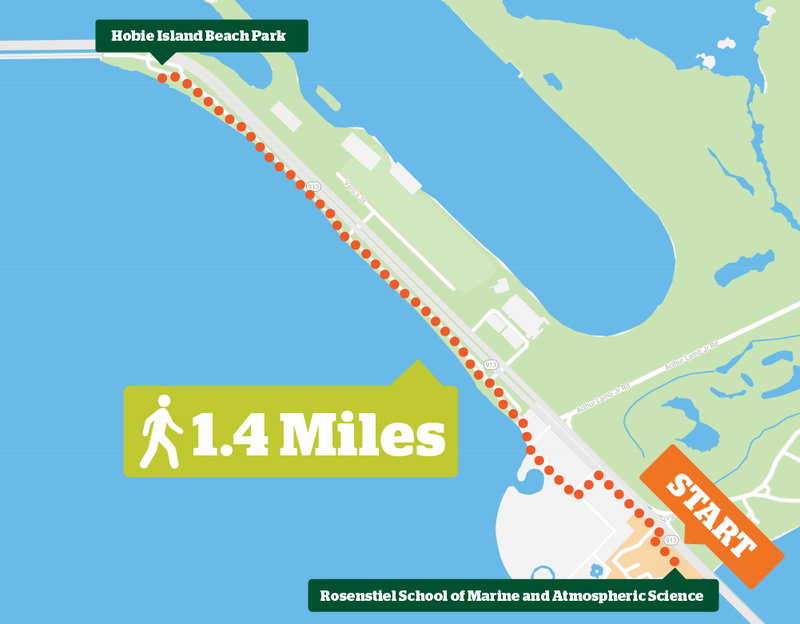 This scenic route is just shy of the total 3.1 miles you’ll need to complete during the DCC 5k but you can add a quick cool down loop around campus or sneak in a few extra steps walking back to your office after admiring the beautiful Biscayne Bay. When leaving the front entrance of campus, make a left and head to Hobie Island Beach Park. Expect some Hurricane Irma recovery efforts taking place along the way, so be sure to take extra precaution and adhere to all signage and closures. One way is about 1.4 miles of pure nautical bliss. On the lush grounds of the Coral Gables campus, it’s easy to sneak in steps no matter where you are located. The route below requires two laps and it’s only one of the many ways to get around campus. With views of Lake Osceola, Gifford Arboretum, and Rock Plaza, you’ll forget that you’re training. This route also conveniently starts and ends near the Rathskeller and Donna E. Shalala Student Center so you have options to grab lunch or coffee before you head back to your desk. 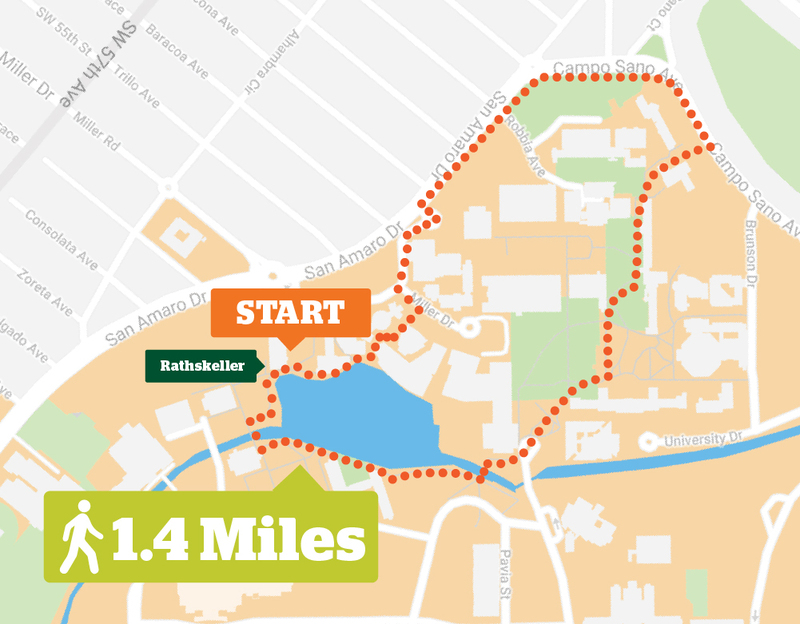 While the two loop route is just shy of the total steps needed to complete the DCC 5k, we know you’ll squeeze in the extra distance by making your way to the center of campus. 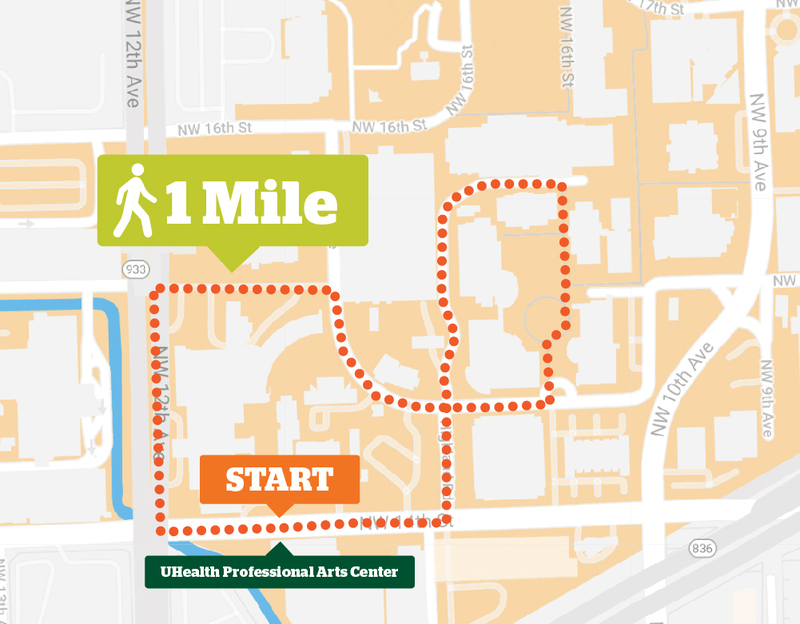 Tucked away from the hustle and bustle of Miami’s health district with shaded gardens and detailed patios there are many routes that will keep you motivated when training on UHealth’s campus. We’re starting your route at UHealth’s secret butterfly garden and looping you past some of the best sights on campus. At just over one mile in distance, you’ll need to do three laps of the route outlined on the map below. Admire the fountains and foliage as you power through spaces near the Lois Pope Life Building and around the Schoninger Research Quadrangle. If you’re training on a Thursday afternoon, be sure to stop by one of our favorite vendors at the Well ’Canes market. Have you tested out our routes or tried others of your own? Tag us on IG @lifeattheu and let us know how your training is going. We can’t wait to see you at DCC on April 6!